It's a ways off - not until October - but the mere whiff of a woolen kilt and my super tuned Scottish sonar is pinging at me like Sean Connery just defected in his submarine in my general direction. I love this annual seaside celt fest down at the Ventura County Fairgrounds. It's a hoot to be sharing haggis stories, bumping into your neighbor who just happens to be a professional bagpiper, and just feeling the tartan love under the palm trees. I look forward to the Scottish folk music, the highland dancing, and of course, and the organizers know their audience so well, large men throwing things! Here's the official rundown of the what, where and when, and if you have a haggis story let me know! With all the flippin' rain in California this weekend AND the week ahead - I was starting to wonder why on earth I didn't own a pair of wellies anymore. That quintessential British footwear had been long forgotten by me about a week after moving across the pond, and 15 degrees south, and I realized I was in danger of trenchfoot in anything with a covered toe. I had become a devoted wearer of flip flops, (or 'thongs'...but that's another conversation for another time). So, I got to googling welllington boots and among the array of a million designer rubber boots that popped up I found these proudly declaring their national pride of place in wellie world. 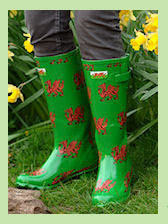 The design on the “welshwellies" includes the Welsh Dragon, Welsh Flag and “Cymru am Byth” (that 'Wales Forever' my fellow non-welsh speakers). Of course, with wellies you have to wear a good pair of thick socks that don't wriggle their way down under your foot during the day. There's a good reason...buried deep in my childhood memories is a sorrowful 'tail'. I used to play hide and seek at a cousin's house. It was very old and rundown, with a coal cellar. The cellar had fantastic hidey holes among boxes and stored stuff. After one wet day visit, I splashed my way home and as my mum helped pull off one of my boots a dead mouse dropped out. True story I swear. My mum will swear to this too, granted with eyes glazed and a momentary retreat into a safe and happier place. The unlucky rodent, crushed and semi-flattened, must have slipped down into my wellie while I was hiding and then suffocated. I do remember thinking as I walked home how my 'sock' felt all lumpy in my boot. I think I just realized the real reason for my love of flip flops. May your feet stay dry and your socks stay up! 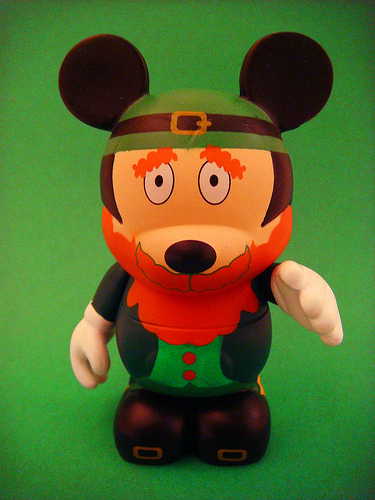 Miska, Muska...Happy St Patrick's Day! Damn, blast and bugger...I missed Solas playing at the Ojai Concert Series back in February, and Old Blind Dogs before that! Now that would have a been a cèilidh! A couple of years ago we camped out at the Live Oak Music Festival, in the hills above Santa Barbara. Hanging out in a field with the other Oakies, a beer, endless music and free spirited kids, young and old was a hoot. It brought back rose-tinted memories of doing just the same at Fairport Convention Cropredy Festival back in the UK...I do so miss my damp sleeping bag, over inflated airbed, and after a couple of days... the aroma of 'eau de tent'! So, with that in mind I'm keeping my ear to the ground, which will probably be beer soaked (from a reputable micro brewery I'm sure) and hoping to catch the next folk gathering, tent optional. The Ojai Concert Series is hosted by the Ojai Valley Woman's Club, in downtown Ojai, and in the summer months at the Dancing Oak Ranch. 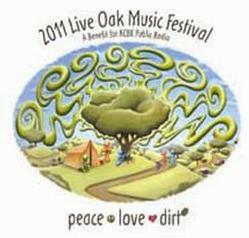 The Live Oak Music Festival is a three day concert and camping event held every year on Father’s Day weekend in the hills above Santa Barbara. When I was a kid, growing up in the UK, my favorite breakfast was Weetabix...and, wonder of wonders I found this British classic a few years ago in my local Vons! Well, cover me in sugar and call me breakfast too! I loved the unwieldy bricks of wheat and grain with hot milk and a half the sugar bowl. If there was no milk it was a hot water...I was 10. It made sense then. Today not so much sugar, or hot water (ever)...but the milk still has to be hot...even in summer! My daughter carries on the tradition and does use half the sugar bowl. There was a TV ad campaign back in the 80's that had animated Weetabix skinheads (that was the 80's England for you) - if you ate Weetabix you were 'hard'. Oh, how times change and now it's all about healthy eating and a reliable colon. Weetabix 'Hard Men' UK TV commerical from the '80s. While reminiscing and looking for the old TV ad I found whole forum discussions on how other people eat their Weetabix...dry with butter, and there's even a chocolate version..what! California of course has it's own version...add fruit, call it organic and sell it at Trader Joe's, which is great as it's half the price!